From Goodreads: It seems almost sacrilege to infringe upon a book as soulful and rich as Willa Cather’s My Antonia by offering comment. First, published in 1918, and set in Nebraska in the late 19th c., this tale of the spirited daughter of a Bohemian immigrant family planning to farm on the untamed land (“not a country at all but the material out of which countries are made”) comes to us through the romantic eyes of Jim Burden. He is , at the time of their meeting, newly orphaned and arriving at his grandparents’ neighboring farm on the same night her family strikes out to make good in their new country. jim chooses the opening words of his recollections deliberately: “I first heard of Antonia on what seemed to be an interminable journey across the great midland plain of North America,” and it seems almost certain that readers of Cather’s masterpiece will just as easily pinpoint the first time they heard of Antonia and her world. It seems equally certain that they, too, will remember that moment as one of great light in an otherwise unremarkable trip through the world. Ántonia, who, even as a grown woman somewhat downtrodden by circumstance and hard work, “had not lost the fire of life,” lies at the center of almost every human condition that Cather’s novel effortlessly untangles. She represents immigrant struggles with a foreign land and tongue, the restraints on women of the time (with which Cather was very much concerned), the more general desires for love, family, and companionship, and the great capacity for forbearance that marked the earliest settlers on the frontier. 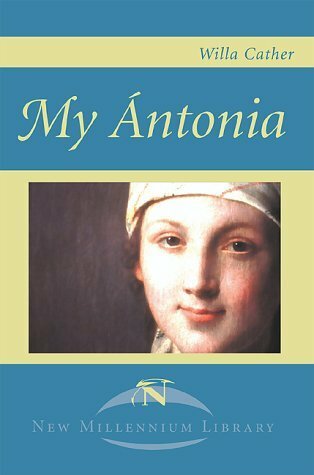 My Reveries and Ramblings: My Antonia by Willa Cather is about the friendship between a boy, Jim, and an immigrant girl, Antonia. Willa Cather’s novel deals with issues such as immigration, suicide, prejudice, and unrequited love. My Antonia is a charming coming-of-age story set in the late 19th c. The characters are realistically written. The story is narrated by Jim and is a compilation of memories from his childhood and young adult life-mostly revolving around Antonia. To be honest, I did not want to read this book-mostly because it is a realist work. I’m not a huge fan of realism-I find it quite depressing. I still wonder why I decided to take a class on American Literature that concentrated on Realist works. Since I had to read and write a paper on a realist work, I was dreading it. But it truly surprised me. I did not expect to like it at all. I recommend you read this if you like classic American Literature. Even if you don’t, it’s still a good read; and by far my favorite of all the books/short stories I had to read for that class. I give it 3/5.